Iranian missile technicians secretly visited North Korea as part of joint development of a new rocket booster for long-range missiles or space launchers at the same time nuclear talks took place in Geneva, according to U.S. officials. One official described the new booster as a thruster for a "super ICBM" or a heavy-lift space launcher. "It is completely new from what they have done so far," the official said. "Why does the administration want so much to negotiate a nuclear agreement with Iran if they know full well that that country is building nuclear delivery vehicles?" the official asked. State Department and White House National Security Council spokeswomen had no immediate comment. A Defense Intelligence Agency spokeswoman declined to comment. Additional intelligence reports based on satellite imagery reveal that North Korea is developing a larger missile or space launcher than its previously known rockets. The indications include a launch tower at one facility that is substantially taller than other known towers spotted at North Korean launch sites. The blog 38 North, part of the Johns Hopkins University School of Advanced International Studies, disclosed last month that satellite photos showed a expansion at a North Korean launch site for a larger rocket. Both North Korea and Iran are believed to be hiding their long-range missile programs, part of space-launcher development, as a way to avoid international sanctions. Meanwhile, the State Department’s special envoy for North Korean nuclear affairs Glyn Davies said in Tokyo on Monday that Pyongyang could be hit with additional sanctions if the regime fails to show a willingness to give up its arms program. "If we do not see signs of North Korean sincerity, if they do not act, demonstrate that they understand they must fulfill their obligations, give up their nuclear weapons, then there's more pressure that will be brought to bear on them," Davies told reporters, Kyodo reported. The reports of a new North Korean rocket booster coincide with the emergence of a key official within the North Korean regime last September. The official, Pak To Chun, surfaced in public after a mysterious four-month absence from the public eye. Pak is a member of the powerful National Defense Commission and a key official in charge of North Korea’s long-range missile and space launcher programs. 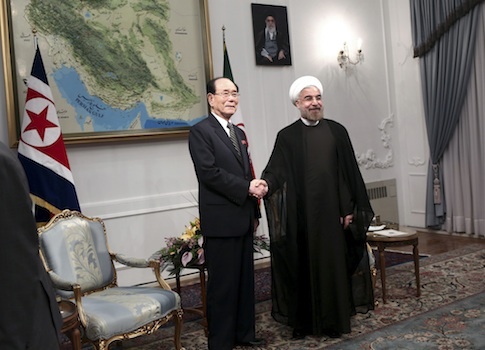 North Korea and Iran announced plans to develop closer relations, including defense, science and technology ties, in September 2012 when Kim Yong Nam, a senior North Korean official, visited Tehran. Kim met with Iran’s supreme leader Sayed Ali Khameni. Both sides said at the time that they would cooperate against the United States. The Iranian company SHIG, part of the Aerospace Industries Organization of Iran, has developed all of Iran’s liquid-fueled missiles, including the Shahab series that is based on North Korea’s Nodong medium-range missiles. The company was sanctioned by the United Nations for its role in illicit missile transfers in 2006. The U.S. government has also sanctioned it for illicit missile exports. SHIG experts were known to have visited North Korea previously in 2009 to take part in a missile test launch that year of a Taepodong-2 (TD-2) missile. A report published in July by the National Air and Space Intelligence Center stated North Korea is continuing to build TD-2 long-range missiles and space launchers. "Continued efforts to develop the TD-2 and the newly unveiled [mobile] ICBM show the determination of North Korea to achieve long-range ballistic missile and space launch capabilities," the report said. The report also said Iran has carried out several launches of a two-stage Safir space launch vehicle and in 2010 unveiled a new larger launcher called the Simorgh. "Iran will likely continue to pursue longer range ballistic missiles and more capable [space-launch vehicle], which could lead to the development of an ICBM system," the report said, noting that "Iran could develop and test an ICBM capable of reaching the United States by 2015." Disclosure of the Iran-North Korean missile cooperation could upset China’s efforts to restart the stalled six-party talks on North Korea’s nuclear program. The United States and South Korea are opposing a resumption of the nuclear talks until North Korea demonstrates that it is willing to dismantle its nuclear facilities. A State Department cable from 2009 made public by Wikileaks stated that North Korea’s Amroggang Development Bank worked with the Korea Mining Development Corporation (KOMID) in the past in selling missiles and technology to SHIG. Another cable on Iran’s Ballistic Missile program from 2009 states that "Iran has the largest and most active missile program in the Middle East." "Iran has accelerated its work toward developing a domestic space program," the report said. The Safir space launcher "has demonstrated several capabilities necessary for longer-range ballistic missiles: staging, clustered engines in the second stage (although these were small), and gimbaled engines for control of the second stage, a more advanced technique than the jet vanes used in the first stage," the report said. "Iran currently appears focused on increasing the capability and range of its ballistic missiles," the report said. "Although Iran is unlikely to deploy the Safir SLV as a ballistic missile, the Safir, and the development and test of the two-stage Sajjil [medium-range ballistic missile], has provided Iran with much of the technology and experience necessary to develop and produce longer-range ballistic missiles, including ICBMs." "Tehran could attempt to develop and test much of this technology under the guise of an SLV program." This entry was posted in National Security and tagged Ali Khamenei, China, Iran, North Korea, Nuclear Weapons, State Department. Bookmark the permalink.